These two under-the-radar AI stocks could win big. Artificial intelligence (AI) is gradually becoming a bigger part of our lives. From self-driving cars to interactions with virtual assistants and simple searches on the internet, you can be assured that there's an AI algorithm working in the background to come up with the best results. It is well-known that NVIDIA is driving innovation in self-driving cars and Microsoft in the cloud, but a few smaller companies are using AI as a springboard for their growth and investors could benefit from taking a look. Xilinx (NASDAQ:XLNX) and Ciena (NYSE:CIEN), for instance, provide the infrastructure that's critical to the deployment of AI. 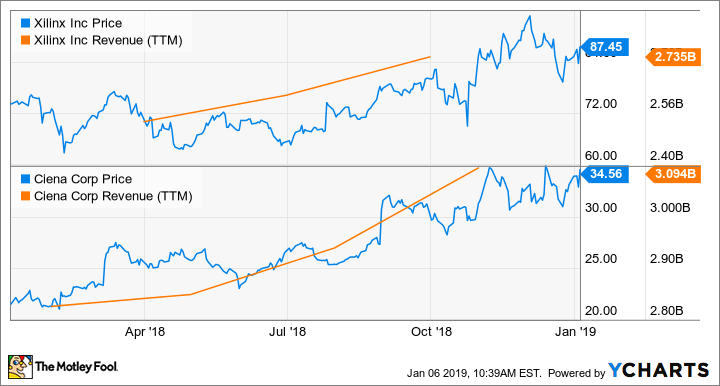 Not surprisingly, both companies delivered solid gains last year, and they won't be hitting the pause button anytime soon. NVIDIA has been making waves in AI thanks to its graphics cards, which are considered best suited for training AI models as they can process huge sets of data thanks to the presence of hundreds of cores. But Xilinx's field-programmable gate arrays (FPGAs) -- chips that can be reprogrammed for specific tasks after manufacturing -- are considered ideal for the real-world deployment of AI models because of their flexibility and low power consumption. Developers can reprogram Xilinx's FPGAs to deploy or fine-tune AI applications, making these chips ideal for the inferencing phase that requires fewer data center resources as compared to the training phase. That's one of the reasons the FPGA market is expected to clock robust growth in the coming years, hitting revenue of $12.1 billion by 2024, as compared to $6.9 billion in 2016, according to one estimate. Major cloud providers are already offering FPGA-based servers on their cloud computing platforms. Alibaba Group Holding (NYSE: BABA), for instance, is using Xilinx's FPGAs to accelerate cloud computing workloads. The choice has turned out to be beneficial for Alibaba, as it has managed to reduce costs by 40% while tackling huge and diverse workloads. Xilinx's chips played an important role in Alibaba's "Singles Day" shopping event in November last year, providing more than 45 billion personalized shopping recommendations to consumers based on their histories. Such benefits are the reason Microsoft has reportedly decided to use Xilinx's solutions for more than half its Azure cloud servers at the expense of Intel's FPGAs. Cloud computing leader Amazon.com is also a Xilinx customer and is expanding its FPGA-based servers to more regions across the globe. So it's safe to say that the chipmaker is on track to take advantage of the FPGA opportunity in data centers because of its partnerships with the major players in this space. In fact, Xilinx is the best means of taking advantage of FPGA growth because it commands 58% of this market and has been growing at a faster pace than archrival Intel. Xilinx's revenue shot up 19% annually during the last reported quarter, driven by a 28% increase in the data center business. Intel's competing programmable chip business, on the other hand, saw an increase of just 6%. Check out the latest Ciena earnings call transcript. It isn't just cars, movie streaming apps, and home devices that are reaping the benefits of artificial intelligence. At its core, AI is technologies that can run autonomously, and those can apply to something as boring as networking infrastructure. For instance, if you have two devices at your office that run on the same network, they might not need the same speed or bandwidth at all times. An intelligent network will be capable of deciding which device needs more bandwidth and operate accordingly. This is where Ciena steps in with WaveLogic Ai, giving operators access to real-time monitoring solutions so they can boost their network's capacity and efficiency. This is a lucrative market to be in, as demand for intelligent networks is expected to increase at a compound annual growth rate of 28% through 2024, according to Zion Market Research. The firm believes that this market was worth just $1.89 billion in 2017, but will grow to $10.87 billion at the end of the forecast period. So the optical networking specialist is currently standing at the threshold of opportunity. Ciena is in prime position to take advantage of the proliferation of AI in networking, as it is the leading vendor of optical networking solutions, according to IHS Markit. But the company isn't leaving anything to chance, which is why it is busy bolstering its networking automation business. Ciena recently acquired DonRiver to boost the capabilities of its software and services portfolio, formally known as Blue Planet. The acquisition will complement Blue Planet's existing offerings and allow Ciena customers to better monitor the different networking elements across a network. Thanks to such moves, Ciena aims to boost its Blue Planet automation software and services revenue to between $100 million and $120 million in the next couple of years. That would be a massive jump from the segment's current annual revenue run rate of around $40 million. In all, Ciena is pulling the right strings to tap into the AI opportunity, and the move has reaped rich results so far. The company's revenue increased nearly 21% year over year during the last reported quarter, a trend that should continue in the long run thanks to emerging technologies such as artificial intelligence. Xilinx and Ciena are leaders in their respective fields, which is why they are in a solid position to capitalize on the growing need for AI-enabled solutions that they provide. That's why both companies should be able to maintain their impressive growth rates, making them ideal bets for investors looking for under-the-radar AI stocks.